Our Religious Education program is nearing its end for 2018-19. We will open up registration for 2019-20 in May. The program will be similar to the information provide on this page. Please peruse our webpage for information on how our program is structured. Participants in last year’s program do not need to register again if your contact information has remained the same. Simply call the parish office (773-525-3016) to indicate that your child will participate or email the RE Director David Heimann. Cost for the program is $240 per family per year. If you need to make a payment for Religious Education for the coming year, you can do so by writing a check and sending it to Saint Andrew Parish or online through Give Central. Looking for a way to teach your children about the faith? We have something for you! 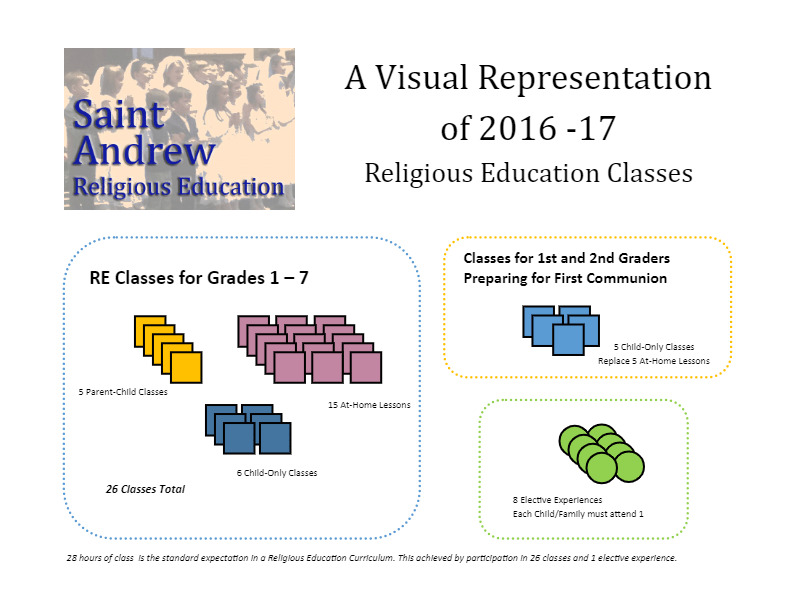 Saint Andrew Religious Education (RE) will offer a family program for families with children from Kindergarten through High School utilizing the Family Catechesis Model. This model has been adopted to the needs of Saint Andrew families after two years of working with families and publishers to have the most flexible and dynamic program we can offer. Not only does this model offer flexibility to kids and families who may have vacations, sports, grandparents to visit, etc. It has also been proven as a way of having families grow together in religious literacy and faith. Classes will meet on Sunday mornings from 8:45 am to 9:50 am. Were excited to offer this program at our parish because of its proven approachability and adaptability for families. We hope you’ll join us in this journey! First and Second Grade students prepare for First Communion through RE. 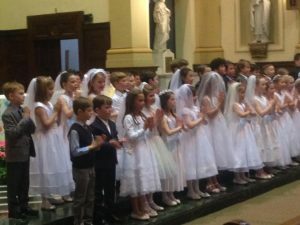 The normal expectation is to prepare for two years and receive First Communion in the second grade. This requires a few additional classes with their teacher for both first and second graders. 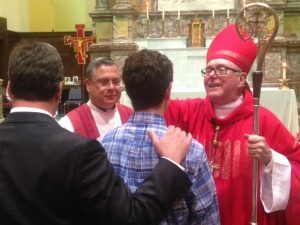 Our Confirmation preparation program is for youth who are in the 7th and 8th grade. This class meets at a different time (4:00 pm to 5:30 pm) on Sundays starting on September 9, 2018 and includes an all-day retreat on Saturday, October 20, 2018. The registration process is the same as the RE program. Those seeking Confirmation should start in the beginning of their seventh grade year and should attend the parent-child meeting on Sunday, September 16, 2018 at 4:00pm.